As one of the most dynamic real estate markets in the country, Penang's outlook remains stable and positive (in the medium to long term), despite the global uncertainties, Henry Butcher Malaysia (Penang) director Jason Teoh says. “This will be sustained by a healthy core demand, manageable mortgage rates and positive economic growth. “An active residential sub-sector will continue to spearhead the market, although it may experience less buzz compared to the previous year. On the island, the hot spot or corridor of opportunities are Batu Maung, Bayan Lepas, George Town, Tanjung Bungah and Teluk Bahang. “On the mainland, the investors would be able to get residential properties that are relatively cheap with low density in strategic locations. “A new enabler the second Penang Bridge will appear in the third quarter of this year. Opportunities may arise not only on the island but on the mainland as well. Investors could consider land around the intersection of the North-South Highway and the second Penang Bridge,” Teoh says. Areas around the five new proposed highways under the Recommended Penang Transport Master Plan Strategy, 2013, could be potential hot locations for the property market, he says. Some of the areas included the George Town Outer Bypass, North Coast Pair Road, Air Itam Relau Pair Road, North-South Expressway Link Road and Third Sea Crossing. Teoh says the volume and value of property transactions grew at a cumulative average growth rate of 8.4% and 13.2% respectively, from 1999-2011. These were even higher from 2009-2011, reaching 20.1% and 26.0% respectively. Of all property types, prices of terraced houses have increased the most over the last few years. 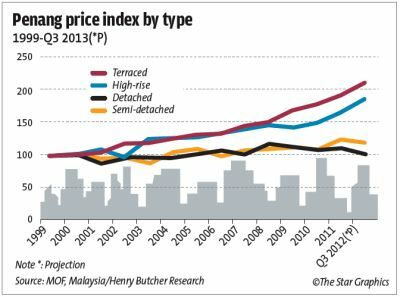 The price index from 1999 to the third quarter of 2012 have increased more than other type of properties. Another property that is in demand, with potential capital appreciation, is the pre-war heritage shophouse. 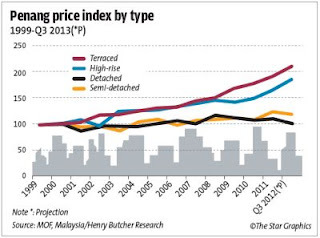 The price index of pre-war properties in George Town started to soar after 1999. Teoh believes the demand for properties in both the new and secondary market will continue to grow and appeal to a wider segment of local and international buyers.